Providing guidance about Road Diet implementation including selecting candidate locations, capacity constraints, public outreach response, evaluation metrics, EMS, slow moving vehicles, cost, or funding. Lastly, FHWA is also offering FREE Road Diet workshops. Find out more about them here. A roadway reconfiguration known as a Road Diet offers several high-value improvements at a low cost when applied to traditional four-lane undivided highways. In addition to low cost, the primary benefits of a Road Diet include enhanced safety, mobility and access for all road users and a "complete streets" environment to accommodate a variety of transportation modes. A classic Road Diet typically involves converting an existing four-lane, undivided roadway segment to a three-lane segment consisting of two through lanes and a center, two-way left-turn lane. Why consider a Road Diet? Four-lane undivided highways experience relatively high crash frequencies — especially as traffic volumes and turning movements increase over time — resulting in conflicts between high-speed through traffic, left-turning vehicles and other road users. FHWA has deemed Road Diets a proven safety countermeasure and promotes them as a safety-focused design alternative to a traditional four-lane, undivided roadway. Road Diet-related crash modification factors are also available for use in safety countermeasure benefit-cost analysis. As more communities desire "complete streets" and more livable spaces, they look to agencies to find opportunities to better integrate pedestrian and bicycle facilities and transit options along their corridors. 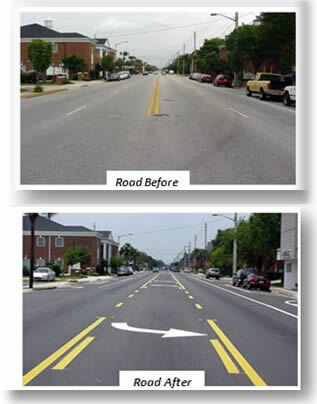 When a Road Diet is planned in conjunction with reconstruction or simple overlay projects, the safety and operational benefits are achieved essentially for the cost of restriping. A Road Diet is a low-cost solution that addresses safety concerns and benefits all road users — a win-win for quality of life. Road Diets stand the test of time, having been implemented by transportation agencies for more than three decades. One of the first installations of a Road Diet was in 1979 in Billings, Montana. Road Diets increased in popularity in the 1990s. Cities, including Charlotte, Chicago, New York, Palo Alto, San Francisco and Seattle, have also opted for the positive impact Road Diets bring to their communities. FHWA developed a Road Diet Informational Guide to help communities understand the safety and operational benefits and determine if Road Diets may be helpful in their location.